Decorating a live Christmas tree, stair garland and front porch with colorful ornaments and beautiful ribbon. I was so honored when Home Depot reached out to me and asked me to help spread the word that you can now order a beautiful live tree from their site and have it shipped directly to your door! The tree that we received was lush and full and perfectly shaped and smelled soooo divine! After shopping at Home Depot for a tree holder, a burlap tree collar, garland, front porch trees, ornaments, tree topper and yummy gorgeous ribbon we had everything that we needed to decorate the front porch, the garland and the tree at my daughter’s house. 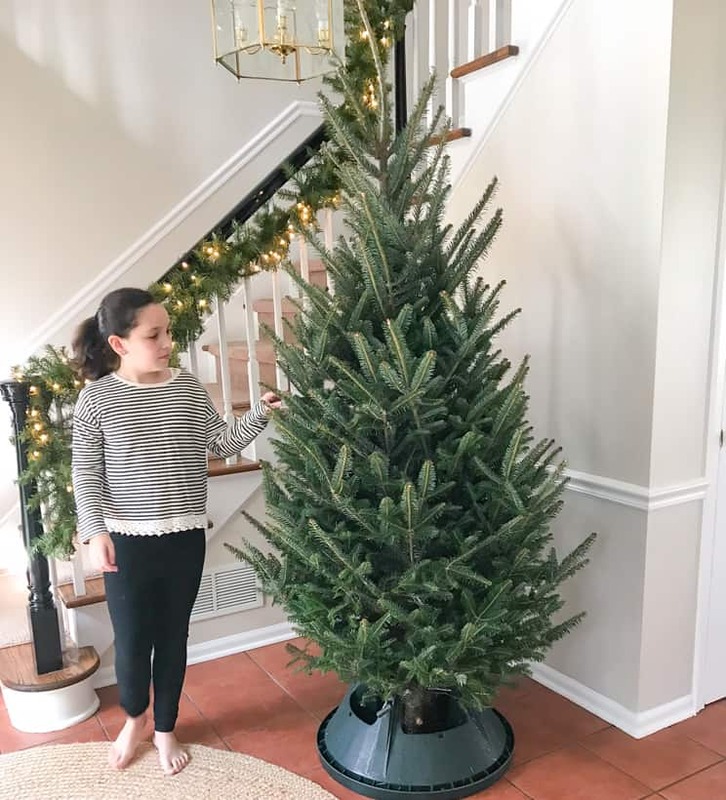 Here’s a sneak peek of the tree, but click HERE to go over to the Home Depot Blog to see the completed porch and tree and to shop all of the products that we used. And if you’d like to watch my daughter and I shop for all the decorations at Home Depot, check out the highlight titled “Style Challenge” that can be found on my Instagram profile! Merry Christmas decorating, my friends! I know! She’s getting so tall! They grow up waaaay to fast!!!!! Love the tree and garland! Think the large bells makes the garland look wonderful, where did you find them, where they a Home Depot find? Thank you, Martha! The bells came from Michaels last year, but I believe I saw them there this year too.